J & D Lawn Service is not like the others. The owner of J & D comes from years of corporate management that puts his love of landscaping and his professional knowledge of communication and quality into this business. Our landscaping professionals mow, edge, and trim turf areas to a proper height . Whenever possible, we use mulching mowers to ‘recycle’ the clippings back into the earth. No job is too big or small for us. We have the proper equipment to accommodate either option. We are overseeding experts for fall planting of perennial ryegrass. We only use locally grown, top-quality seed & fertilizer for our Arizona climate from a local fertilizer company. Or, if you prefer, we can install lush, green sod that comes directly from sod farms in the area. Trimming bushes and shrubs to your preferred style is one of our specialties. Whether you like the shaped topiary look (a la Disneyland) or a more natural style, we can create the look of your choice. We can also plant new or replacement plants to give your yard a whole new feel. Just need help now and then? We can perform one-time clean ups on properties of any size. 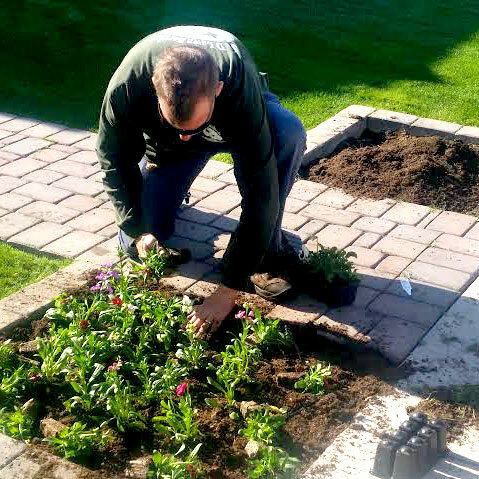 J & D Lawn Service Owner Jim Leeper works hard to keep the company on the cutting edge of service and satisfaction. Jim started J & D Lawn Service after 20 years as a finance professional in the corporate world. It was an opportunity for him push his desk chair back and pursue his love of landscaping. Jim has spent countless hours working with all of his employees and crew leaders to bring them up to the level of quality that is required for the business. His philosophy to achieve success? Always be honest. Jim and his customers understand that perfection is the goal for J & D Lawn Service. If somehow the mark gets missed, Jim and his team will communicate openly and strive to make things right. Jim has been an Arizona resident since 1987 when he moved here from Iowa. Growing up in Iowa, Jim spent lots of time on a 1.5-acre parcel of land that always required his landscaping attention. It was this experience that helped Jim cultivate his love for the Midwest landscape beauty. It’s this type of quality that Jim and his team work toward in every property they service. Jim married his high school sweetheart, Diane, who is the ‘D’ in J & D. Jim and Diane have two sons, Jordan and Justin. Jim and Diane love living in Arizona and enjoy spending time outdoors in our amazing desert climate. It is a clear understanding that everyone is very busy these days. The last thing you want to worry about is when or if your landscaping will be done this week. J & D holds a very tight weekly schedule. If you are on a particular day for landscaping service you can be assured that it will happen each week and on the day for which you are scheduled. When a crew is ready to leave a property, it is a mandatory practice that the crew leader do a final walkabout to verify the property is at a level of quality that the homeowner will be satisfied with. All crew leaders with J & D Lawn Service are available to speak with any homeowner regarding any special requests that they may have for their property. J & D Lawn Service excels in its professional and courteous communication between its crews and any homeowners. We focus and letting our clients know what is going on with their properties. Many scenarios can come into play with your landscaping such as weather, growing conditions, etc. We will always keep you in the know about your yard and how we intend to care for it. I have been a customer of J & D’s for nearly three years. I can honestly say the communication with the crew leader for my yard is amazing. It is such a treat to know that I can talk with my crew leader about any request I may have. J & D rocks!! I recently became a customer of J & D’s in November of 2014. I met Jim at my property to discuss my requests for what I was looking for in a landscape maintenance company. Jim and his crew have completely held true to everything they said they would do. Jim’s communication with me early in the process put me at ease with my change to J & D Lawn Service. I am completely satisfied!!! How often do you service a property? We offer any schedule that is requested by the homeowner. We will however give our opinion, based on the nature of the landscape, on how frequent a service should be performed. We offer weekly, bi-weekly or monthly services. Do you offer cleanup service? Yes. We offer one time cleanup services. All cleanup projects are performed with the same quality that we offer for our recurring customers. Do you install new landscape? J & D is not a installer of brand new landscape on a one time basis. J & D ‘s focus is for recurring maintenance. We will provide new plants, trees, flowers, etc. at the request of a recurring customer. Absolutely! All quotes are free of charge. Jim or one of his crew leaders will be happy to meet with you and discuss your property and any special requests. with top quality, local seed and fertilizer, will provide you an amazing winter lawn you will love. Do you provide tree trimming service? No. J & D is not a tree trimming company. If a recurring customer has one or more trees to trim, we will connect them with the proper tree trimming service to take care of the request. Yes, we are insured. J & D has a liability policy and workers’ compensation policy that will ensure that you and your property are protected at all times.